1 of 1 Whisk 2 tablespoons of the soy sauce, sesame oil, lemon juice and 3 teaspoons of the ginger in bowl. 1 of 3 Place tuna in a large resealable plastic bag; add marinade. Refrigerate 30 minutes, turning once. Mix mayonnaise, remaining 1 teaspoon each ginger and soy sauce in bowl. Refrigerate alongside tuna. 2 of 3 Prepare grill with medium-hot coals or heat gas grill to medium-high; coat rack with cooking spray. 3 of 3 Remove tuna from marinade; pat dry with paper towels. Grill 3 minutes per side for medium. Transfer to platter; tent with foil. 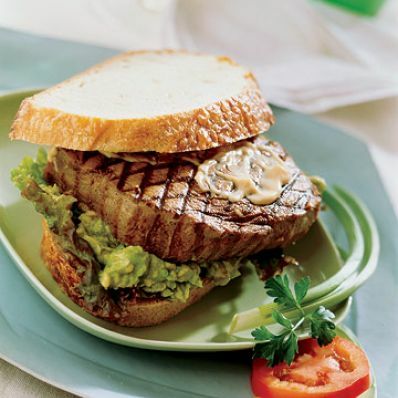 Top bread with lettuce, then mashed avocado, tuna and flavored mayonnaise. Per Serving: 3 g sat. fat, 4 g fiber, 31 g carb., 58 mg chol., 19 g Fat, total, 742 mg sodium, 31 g pro., 424 kcal cal.